U.K. synthesist Kevin Kendle has to his credit numerous releases of Contemporary Instrumental music. Fortunately for STAR'S END listeners every few years or so he puts out another album of pure Spacemusic through his wonderful Deep Skies series. 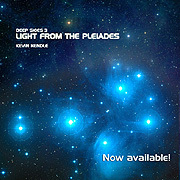 Light From the Pleiades (62'11") is the third such work and features seven gorgeous sonic impressions of this much heralded grouping of stars. Drawing on his fascination with the cosmos, Kendle realizes music that is majestic, engaging and deep. Icy synth chords soar high above pulsing electronic bleeps while an ethereal choir sings in homage to the universe. Further into the experience a rumbling soundmass passes beneath lofty glissando guitar lines and grainy sweeping pads. This music is well conceived and executed, and proves to be a cosmic experience in and of itself - even without the aid of astronomical maps or visuals. In actuality, deep space is surely a vast forbidding void, as cold as it is dark - but Kevin Kendle sees not the emptiness, but the incandescent beauty of the celestial realm.